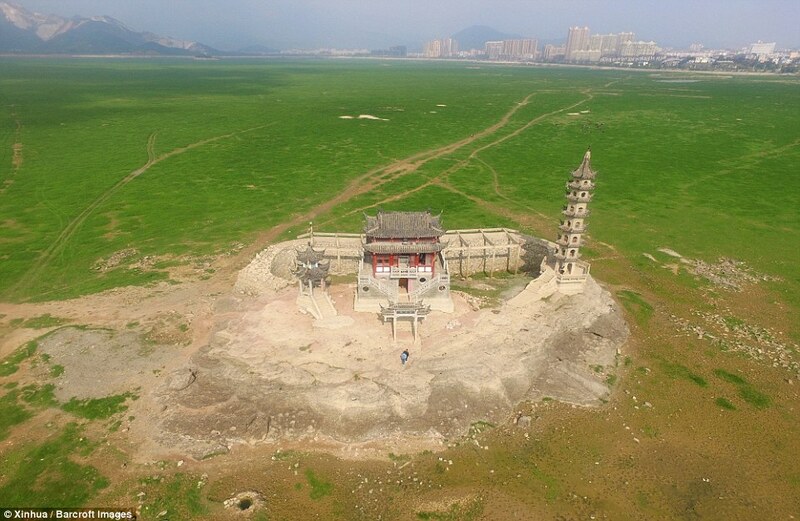 Much of the Poyang Lake, the largest freshwater lake in China has almost completely dried up. The once expansive and abundant lake has turned into a huge grassland, allowing residents to walk across on foot. At one time, the lake was 1,737 square miles, larger than most cities. It is located in the northern part of China's Jiangxi Province. Unfortunately, the region hasn't seen significant rainfall since mid-September. The lake, which is about three times the size of Greater London, has essentially disappeared after the region shortage of rainfall. Above, you can seen an image of ship that has become stranded on the dried lake bed. According to the Xingzi Hydrological Station, the water level has declined to 34.8 feet. The declining water level has caused alarm for local fishermen who have watched the declining size of their catch. This decrease comes after a decade of reduced numbers. The lake, which became swollen by El Nino rains earlier this year, has dried up dramatically. It is connected to the Yangtze River which has experienced a drop in water levels due to reduced rainfall and human activity. The Poyang Lake regularly dries out in winter, but this year's dry spell is 54 days earlier than usual due to drought.